With an unstable regulatory environment, high tariffs, underwhelming tax returns, low consumer confidence, a lack of incentives, and rising interest rates, economists aren’t surprised by the sales dip the industry is experiencing. Perhaps the worst news is that there is no expectation for a turnaround any time soon. According to a report by Automotive News, the four major sales forecasters expect a drop in March of between 1.5% and 6.7%. 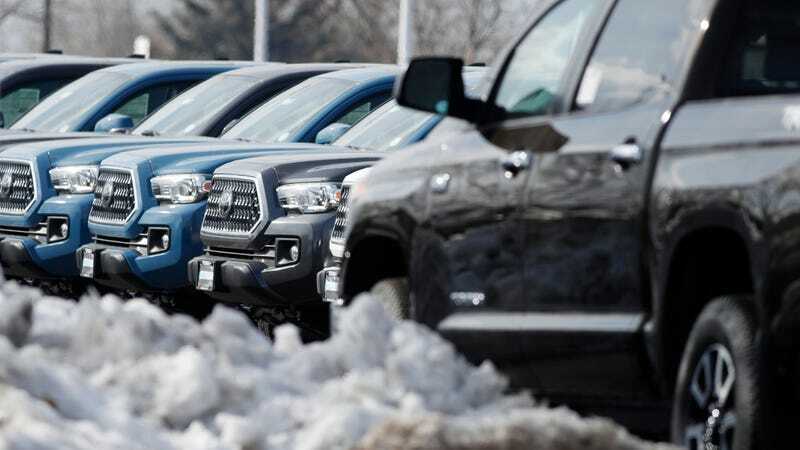 To be more specific, auto industry sales watchers TrueCar, Edmunds, J.D. Power, and Cox are predicting March sales declines of 1.5%, 4%, 5.6%, and 6.7% respectively. It is possible at this rate that U.S. car sales for the year will shrink below 17 million for the first time in years. We’ll see the full official numbers from automakers on Tuesday, but none of them seem to be particularly optimistic. The Cox estimates read most dismal, projecting that every major auto manufacturer will experience a sales dip this month. This includes Subaru, which hasn’t seen a down month for over seven years. Nissan, Cox says, will be hit the hardest, with a double-digit 12.6% sales crunch in the North American market. The Fed has recently increased interest rates, which President Trump has been vocally opposed to, leveling the full blame for an economic slowdown on this single move. It’s a little more complex than that. A volatile stock market, trade policy trepidation, and a 7 point dip in the consumer confidence index lay the seeds for an all-around economic slowdown. Cars are getting more expensive, with an estimated 2.8% increase in the average transaction price over this time last year. The average incentive offered by automakers is down about 5% over this time last year. The tax reform that kicked off last year had a positive effect on 2018, but has resulted in a lower refund for many consumers this year, which many buyers use as a catalyst for new car purchase. It’s been a rough few months for car makers and dealers, and it doesn’t show any signs of getting better. Buckle up, save your pennies, we might be headed for something bigger than cars.